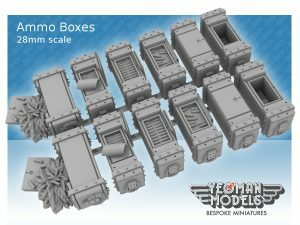 I have recently put on Shapeways a set of Ammo Boxes in both 28mm scales and 35mm scales. As you can see from the image above the ammo boxes are in different states, so there are unopened ones, half used ones, split ones etc. The boxes have detail on all sides and would be great to use as scenery or as tokens for tabletop games. Also, a little update on some train scale models. I have been asked to make a Four by Four car from the 40’s. I have made a N Gauge and TT Gauge model, and will be working on a HO/OO next and possibly a 28mm and 35mm scale in the coming weeks.